When it comes to taking the driving test, many learner drivers fear the driving examiner. Generally it is a misconception that driving examiners are rude or mean to the learner. Part of the training process for examiners set out by the DVSA is to deal with the public and driving test candidates in an appropriate manner – being polite, clear and professional at all times. You will of course find rude individuals within all industry sectors, driving examiners being no exception. We’ll take a look at the role of the examiner, are examiners friendly and do they actually deliberately fail you. A full time examiner will work from 8.30am to 4.30pm five days a week. Certain examiner may work Saturdays if the work is available and in the summer months, they may finish later if they wish. Although an examiner has a general set of rules they must abide by for passing or failing a driving test, they can use their discretion in certain situations. Driving through a red light for example during a test is a failure and nothing can be done to change the outcome. Although if for example a learner was to hit the kerb whilst parking up, a good examiner will request that the learner parks up a little more than usual to establish if hitting the kerb is a frequent mistake or a one-off. Many years ago the role of the driving test examiner was often filled by retired policemen. Along with this came the rather stern and cold attitude that many of the police seem to have. Things however have changed and anyone that has held a UK or EU driving licence continuously for a minimum of four years and has no more than three penalty points can apply to be a driving test examiner. Part of the four week driving examiner training course set out by the DVSA is customer focus. The majority of test candidates are going to be nervous and during the test may be come stressed and unpredictable. At the end of the test, if they have failed candidates on occasions get angry. An examiner has to be able to deal with these situations in a professional manner and to calm the situation. We do of course hear of many complaining that the examiner was rude or mean to them or generally being cold or impolite. A driving examiners job may become monotonous and perhaps boring after a time which for some, may lead to a less than friendly approach. Many examiners also try to remain impartial to a candidate rather than strike up too much of a friendship as this will be easier if there’s bad new at the end of the test. The role of an examiner can of course be stressful too. Being subjected to lethal driving of learners who are in no way up to test standard, combined with no law making it mandatory for candidates having to take a driving test in a vehicle fitted with dual controls. It would I’m sure make sense for such a law to exist and also that a certain amount of professional driving lessons should be taken before sitting the driving test. Although it must all too easy to become impatient with a learner driver who appears to have no idea what they are doing, there is a fine line between being rude and overly stern. There are around 380 driving test centres spread throughout major towns and cities in the UK. From over 2000 driving test examiners, the number allocated to each test centre depends on how many driving tests are conducted each year at a particular centre. 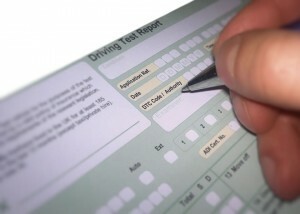 Each driving test centre has its own pass rates which are generally related to the area the test centre is located in. An area featuring complex roads and traffic systems along with a high density of traffic will generally have poorer driving test pass rates than a test centre located in a rural area. Although the DVSA state that they do not have a set quota for each test centre, they do measure pass rate statistics for each driving examiner and compare those statistics to examiners who are assigned to the same test centre. Each examiner must stay within 10% of the overall test centre pass rate or the DVSA may investigate the examiner who deviates outside of this 10%. This may force examiners to fail a driving test that they may normally pass, or worse still in terms of road safety, pass a candidate even though they should have failed so as to keep within this 10% threshold. Many driving instructors get asked ‘Do driving examiners deliberately fail you?’ The answer may well be yes so as to keep them flying under the DVSA investigation radar. They may of course deliberately pass you too. The majority of driving test examiners are polite and conduct driving tests in a appropriate manner expected by the DVSA and by test candidates. If you feel that your driving test was conducted inappropriately, you may make a complaint against the driving examiner to the DVSA and appeal the driving test results. The first stage of a driving test appeal is to contact the DVSA on 0300 200 1122. Ensure you have at hand your driving licence number, practical test booking reference number and if applicable, your theory test pass certificate number. The DVSA will also like to know the type of test you have taken, the date, time, place and the reason for complaint. It is highly unlikely the DVSA will overturn the decision of the examiner. Essentially, it is your word against the examiners. To help minimise the risk of inappropriate behaviour of a driving examiner, consider taking along your driving instructor, friend or family member on your driving test. In the event of any striking action taking by DVSA examiners, there is still a possibility that your driving test may go ahead as the DVSA often employ extra examiners and not all examiners are striking. If you do have concerns about your test taking place, ensure you cancel or reschedule the driving test by providing a minimum of 3 working days’ notice. (Saturdays included as a working day but not public holidays). By doing so, you will retain your test booking fee. If you turn up for your driving test and the test centre is unable to conduct your test, the DVSA will reschedule the test for you and you may also be able to claim out-of-pocket expenses. See here for further details. “Not all examiners are members of the PCS union. Even if they are, we can’t be sure that they’ll support the strike. So we’re asking you to come for your test so it can go ahead if possible. We’re sorry for the inconvenience this will cause. We’ll do everything we can to minimise disruption for our customers.” You won’t have to contact DVSA to rebook if you can’t take your test because of the strike action. You should hear from the agency with a new date within 5 to 10 working days. Of course most of us are nervous when it comes to taking the driving test, but be friendly and a little chatty with your examiner. They may have had many driving tests all week and it may start to get a little tedious for them. A bit of a chat and perhaps a laugh may make all the difference between them turning a blind eye to something they may normally deem a fail (providing it’s not too serious). After all, they are just human. Although in certain countries, bribing a driving test examiner is relatively common, in the UK bribery is rare. Even in the unlikely chance you know of an examiner who accepts bribes, during a test you are assigned an examiner at random and requesting a particular examiner for your test is not an option. Attempting to bribe an examiner will lead to an immediate test failure and will likely be reported to the DVSA who will investigate and take action. The situation is likely to lead to a conviction and possible custodial sentence. If your application is successful, you will undergo the DVSA’s own training. You do not need to be or have been a driving instructor to enrol. A driving examiners pay is reasonable at around £24,687, plus various other benefits. It is essential that you are a person who is able to appropriately deal with a wide range of people. Test candidates emotions are high during a driving test and failure to some can be devastating which can lead to various emotions and on occasions anger. As there is no law that requires a person to receive a certain quantity of professional driving lessons before taking a test, you will experience a wide range of driving skills from candidates. These will vary from excellent and safe, to outright dangerous. It’s even been known on many occasions for examiners to halt the test by pulling the candidate over, exiting the car and walking back to the driving test centre – leaving the candidate in the car. Your training will of course prepare you to deal with this. You will be expected to interact with test candidates in a calm and professional manner at all times, although becoming overly friendly may prove difficult when it comes to failing people. This is why examiners tend to professional, but reserved. The job of a driving examiner can be interesting, but to some it may become repetitive. Generally, each test will be similar to the last, but if you like the idea of being out-and-about and meeting new people on a regular basis, becoming a driving examiner may be for you. Information for how to become a driving examiner along with training information, who can apply and the driving examiners salary can be found on the DVSA website. Driving examiners vacancies if available can be found by visiting the Civil Service jobs website. The DVSA also advertise job with Jobcentre Plus. I passed my test yesterday from Chesterton Road test centre. This was my second attempt of the test, the first test was at Cowley Road test centre. I found my driving examiner (a gentleman called Reagan) extremely professional, fair and put me at ease, and I felt completely relaxed. So its a thumbs up from me for Chesterton Road test centre. Good luck for everyone who plans to take a test from here. Congratulations Mark! I’m quite familiar with this test centre and the examiners have always been professional, fair and polite. I passed my test today yet was left in tears by my examiner for his debrief afterwards at the test center. His feedback and manner was entirely rude and uncalled-for especially when I had passed my test. Now as someone who is quite sensitive to this behaviour due to depression and anxiety I feel this is shocking, as if I hadn’t passed and the same feedback or worse was given it would have terrified me into returning again. There is no need to treat someone this way and turned a happy moment into a horrible memory. The name of my examiner was William (bill) unfortunately I cannot see his second name clearly enough but I feel this should definitely get dealt with as someone worse than my self with their mental state could have taken his behaviour a lot worse than just crying for half an hour. Thanks.